Poland has the largest insurance sector in the CEE with nearly € 13 billion in premium written p.a. and a 40 % regional GWP share. 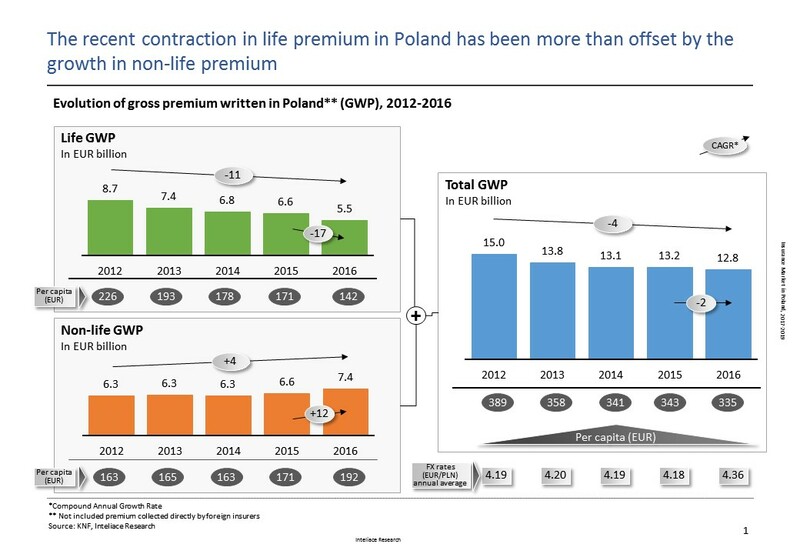 After overcoming the recent stagnation, total insurance premium in Poland is expected to increase at ~7% p.a. through 2019. The non-life insurance segment is likely to continue the fast growth driven by increasing tariffs and a higher number of contracts. Also the improving situation of enterprises is expected to fuel more demand for specialized insurance products in the corporate sector including property insurance. A rebound in new premium is expected to take place in the life business, after a tighter regulatory regime is fully implemented in 2017. Considering the extremely high competition among insurers and a persisting trend for higher claims, it is expected that profitability of insurers will improve only slightly in 2017-2018. For more information on recent developments in the Polish insurance sector, please refer to the full publication. Slide 35: Network multi-agents: Unilink, Consultia, CUK, Conditor, LGK etc.